Sandorfy, Camille - Component of : Early Ideas in the History of Quantum Chemistry. Camille Sandorfy was born in 1920 in Budapest, Hungary. B.Sc. in 1943, Ph.D. in Chemistry in 1946, both at the University of Szeged, Hungary. In 1949 he got his second doctorate, a D.Sc., at the Sorbonne, Paris. 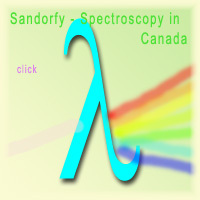 From 1947-1953 Sandorfy was connected with the CNRS (Centre National de la Recherche Scientifique) in Paris in various assignments. 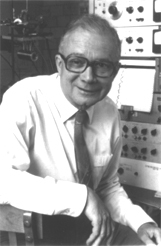 He became Assistant Prof. at the Université de Montréal in 1954, Assoc. Prof. in 1956, Full Professor (Univ. de Montréal) in 1959 - . At left C. Sandorfy in 1970. C. Sandorfy taken from the Univ. Montréal Chem. site in 2002. 1987 Visiting scientist. Laboratoire de Spectrochimie infrarouge et Raman du Centre National de la recherche scientifique. Thiais and Lille, France. 1987 Lecture tour in China (1987). Chemical Institute of Canada medal, 1983. A Symposium on Vacuum Ultraviolet Photochemistry marking my 65th years was organized at the 68th Canadian Chemical Conference at Kingston, Ontario, 1985. The July 1985 issue of the Canadian Journal of Chemistry was dedicated to me on the occasion of my 65th birthday. (Can J. Chem. 63, 1345-2088 (1985). PhD degree, Honoris Causa, University of Moneton, New Brunswick, 1986. PhD degree, Honoris Causa, University of Szeged, Hungary, 1988. World Organization of Theoretical Organic Chemists medal, 1990. Compagnon de Lavoisier (Order of Chemists of Québec), 1992. Membre honoraire de l'Association Canadienne-Francaise pour l'Avancement des Sciences, 1993. Member of the Hungarian Academy of Sciences, 1993. Heyrovsky gold-medal of the Czech Academy of Sciences, 1993. Vol. 297 of the Journal of Molecular Structure has been dedicated to me on the occasion of my 7Oth birthday. Special issue. "Spectroscopy and the Structure of Molecules and Molecular Systems." pp. 1-444, 1993. -	Sth International Congress on Quantum Chemistry. Montreal, Canada, 1985 (Chairman of the Congress). 1. R.N. Jones and C. Sandorfy, “The application of Infrared and Raman Spectrometry on the Elucidation of Molecular Structure“, In Weissberger‘s Technique of Qrganic Chemistry, Vol. 9, pp. 247-580. Interscience Publishers Inc., New York, 1956. Traduit en russe. 2. C. Sandorfy (Préface de Louis de Broglie), ‘Les spectres électroniques en chimie théorique“, Les éditions de la Revue d‘Qptique, Paris, 1959, 230 pages. Traduits en allemand par H. Hirschhausen, Verlag Chemie, Weinheim/Bergstrasse, 1961. Traduit en japonais par Y. Amako, Kinokuniya Book Store, Co. Ltd., Tokyo, 1963. 3. C. Sandorfy, “Electronic Spectra and Quantum Chemistry“, Prentice-Hall, Inc., Englewood Cliffs, New Jersey, 1964, 385 pages. 4. C. Sandorfy “The Chemistry of the Carbon-Nitrogen Double Bond. General Aspects“, pp. 1-60, Interscience Publishers, London, 1970. Editeur 5. Patai. 5. R. Daudel and C. Sandorfy, “Semiempirical Wavemechanical Calculations on Polyatomic Molecules“, Yale University Press, New Haven, Conn. 1971, 133 pages. 8. C.Sandorfy, “Absorption Spectra of Organic Molecules: Valence-Shell and Rydberg Transitions“. Topics in Current Chemistry, Vol. 86, pp. 92-138. Springer-Verlag, 1979. 9. G. Trudeau, J.-M. Dumas, P. Dupuis, M. Gu~rin and C. Sandorfy, “Intermolecular Interactions and Anesthesia: Infrared Spectroscopic Studies.“ Topics in Current Chemistry, Vol. 93, pp. 9 1-125. Springer-Verlag, 1980. 10. C. Sandorfy, “Vibrational Spectra of Hydrogen Bonded Systems in the Gas Phase in Topics in Current Chemistry“, 120, pp. 4 1-84, Springer-Verlag,1984. 11. C.Sandorfy and T. Theophanides, editors. "Spectroscopy of Biological Molecules" NATO ASI series, D. Reidel Publishing Co., Dordrecht, Holland, 1983. (Rédacteur et auteur d'un chapitre). 12. D.W. Urry and C. Sandorfy "Drug and Anesthetic Effeets on Membrane Structure and Function', pp. 91-131. Wiley-Liss, 1991. 13. C. Sandorfy, "The Electronic Spectra of Ethane and Ethylene." In Advances in Molecular Structure Research. Vol. 4, pp. 281-318. M. Hargittai, editor. Jai Press, Inc. 1998. 14. C. Sandorfy, "Petites et grandes minorités: survie et émigration", In "Protection and Development of our Intangible Heritage." H. Kirkinen, editor. Studia Carelica Humanistica, 1998, Finland. 15. C. Sandorfy, editor. "The Role of Rydberg States in Spectroscopy and Photochemistry. Low and High Rydberg States." 532 pages, 16 co-authors. Kluwer Academic Publishers. 1999. Copyright © Feb. 4, 2002 by U. Anders, Ph.D.